This blog generally goes into wall-of-text screenshot diary experiences and/or analysis, because I roll that way. I hope they’re not too disappointed. 1. How do I get to Blue Mountain? Seriously though, if you’re asking this question, I’m really not sure if you’re up to facing the zone. So please be a tide careful when you go in there. 2. 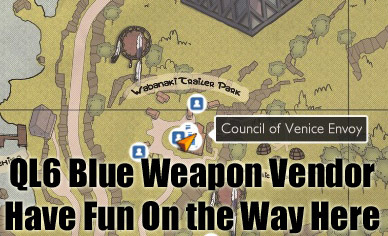 Where are the Council of Venice Blue Vendors? See Savage Coast map bit above. See Blue Mountain map fragment below. Keyword: Wabanaki Trailer Park. I could have shown you my whole map, but that would take away your fun finding the world bosses and lair stuff cos I have map markers sprinkled all over that I’m too lazy to remove. For the record, I’m still using QL6 green weapons that dropped while I was playing in the Moon Bog with even weaker weaponry. It’s not the end of the (secret) world if you don’t get them immediately. This entry was posted in MMOs, The Secret World and tagged blue mountain, blue vendors, blues, council of venice, council of venice vendors, directions, entrance, humor, lolmaps, savage coast, sorta kinda, TSW, vendors. I Have a Nidus, and I’m Not Afraid to Use It!